Jimena Becerra was born in Cali, Colombia on September 5, 1961. During her childhood her artistic abilities were very noticeable, she wrote many poems and won many painting, sculpture and poetry contests. She studied advertising in Medellin, Colombia at the Institute of Arts, where she graduated with honors. In 1983 she got married and started working as Branding and Integral Marketing consultant for the industry, the government and for advertising companies; a career that lasted more than 20 years. Her contribution to the promotion of political campaigns led to security problems for her and her family. This is why the government of the United States of America granted her political asylum. When she arrived in the United States, her aim wasn’t to become a painter and sculptress but, instead, she wanted to continue her career as branding consultant and to learn English as a second language. But being forced to leave her country in that way left her emotionally affected, and the course of her life changed forever. 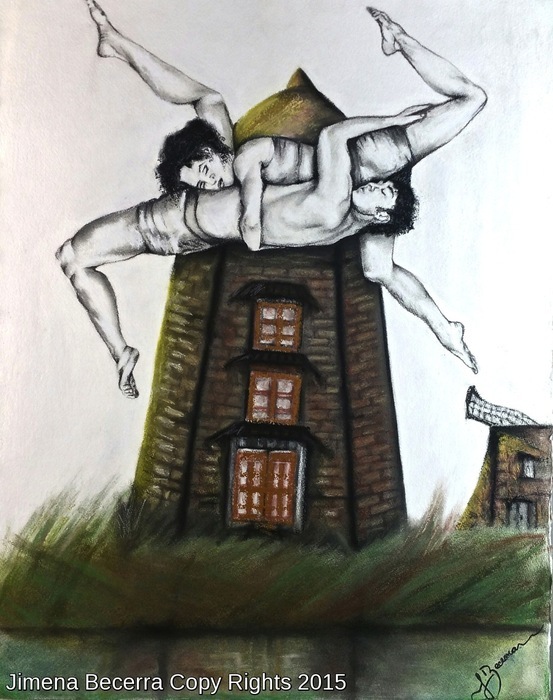 It was during a period of four years of pain, resulting from being away from her country, Colombia, where she was born and grew up and which was her family’s homeland, that Jimena started to consider painting and sculpture seriously; as she states: "to fight this pain through her artistic expression”. It happened when one day, in the middle of the night, she took a paintbrush and started to paint one of her most beautiful paintings: “ Metamorphosis I” which, according to her: “ Is not more than a spectacular symbolism of an internal transformation and growth of my own life. In the same way butterflies grow out of caterpillars human beings suffer internal changes due to the circumstances surrounding us. We transform and grow internally to become better”. This was the beginning of a new career for Jimena that, according to her, will last her whole life. Besides a few art lessons included in her Advertising studies, Jimena is considered an empirical artist. Her research and readings of art collection books helped her acquire knowledge about the artistic pictorial world and her geometry studies led her to find her own symbolic style. While Jimena develops her artistic abilities her paintings and sculptures move towards her own and unique style, strongly influenced by her intellectual studies, her emotions, change of culture and her new life in general. It is believed that her highly creative art, based on symbolic images and similarities tending to surrealism, full of expressiveness and a strong sensuality and emotion will make an impact in the art world. It could be said that Jimena Becerra is the precursor of a new creative style and a visual dynamism: “Symbolism and similarities” that could cause an aesthetic revolution in the world of art. Her fascination for the human figure in movement, the warm colors and the strong contrasts with different types of objects persist in all her artworks. The male and female figures used to represent meanings, storytelling, similarities and emotions are some of the elements present in her works, which take symbolic dimensions in a spectacular and stunning way. I am trying to make art that relates to the deepest and most mythic concerns of human kind and I believe that, at this moment of history, feminism is humanism," said Judy Chicago of her work. 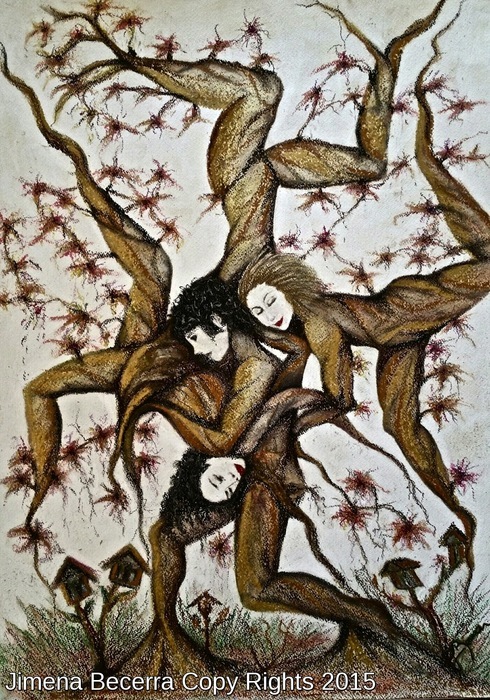 Colombian born, Columbus, OH based, Artist Jimena Becerra's magical mix of human figures with nature reflects this desire to create art that concerns itself with the deepest myths of humanity. 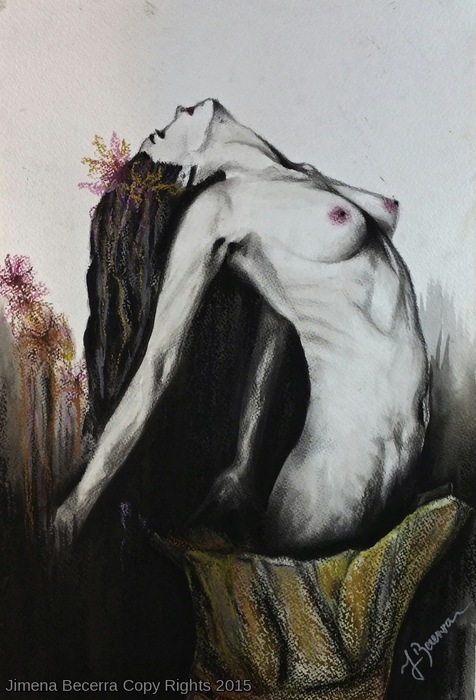 Calling to mind the nymphs of Ancient Greek Myth, Ms. Becerra's pastel, charcoal and acrylics works capture a transformative motion between being human and being part of the landscape, bridging the gaps by showing that it is a truly seamless transition between the two. Within the world of her work, human and nature are one in the same, demonstrating a deep connection with the earth that cannot be forgotten even within the modern age. Unique and deceptively complex, Jimena Becerra's oeuvre of work demonstrates a deep love of both her subjects and the geometric principles that govern them. Using muted colors and clean lines, Ms. Becerra creates a fantastical realm in which people are a part of the trees and the trees themselves are people. There is a love of the human form that bleeds through here, curves and angles are lovingly rendered in equal measure, creating a fantastical realm where branches become fingers and faces blend into leaves. The dichotomy of man and nature is erased via the lens of Ms. Becerra's focused line work, inventing a world that defies and exploits imagination, enticing the viewer even deeper into the labyrinthine trails set out by Jimena Becerra's creative energy. 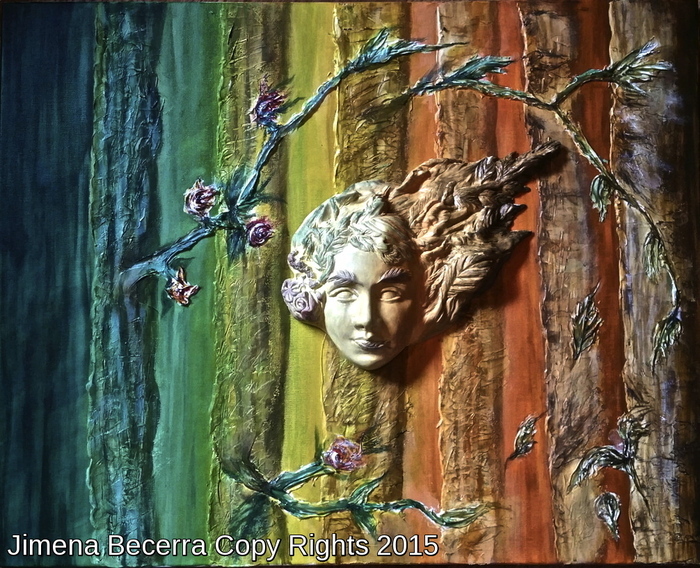 “Metamorphosis” according to Jimena Becerra: “Is not more than a spectacular symbolism of an internal transformation and growth of my own life. In the same way butterflies grow out of caterpillars human beings suffer internal changes due to the circumstances surrounding us. We transform and grow internally to become better." Her expansive vision of the world and its changes radiates with a deep, vibrant understanding of human nature. The desire to evolve and transcend becomes a central theme throughout Ms. Becerra's body of work, eons of development found in every curve even as each figure returns to its "roots". This unique, chthonic outlook on the world provides a safe space for humanity to explore itself within the confines of nature, rather than being separate from it. Resonating with strong motion and depth, Jimena Becerra's body of work reflects a deep understanding of the place of humanity in nature as we continue to evolve. Celebrated across the Americas, Jimena Becerra's tantalizing oeuvre profoundly puts forth multiple questions of existence that we must face and understand if we hope to continue to grow. The Metamorphosis is a symbolism of an internal transformation and growth of my own life. In the same way butterflies grow out of caterpillars human beings suffer internal changes due to surrounding circumstances. We transform and grow internally to become better. To have the companionship of the twists and turns of fate, as a windmill, two together, move in the same direction in life. To find the ideal partner, to share hopes, dreams and realities. Seasons are like human beings emotions, they come and go. Sometimes human beings are fragile like leaves, sometimes they are strong like trees. Happiness makes our lives colorful, like Spring and Autumn seasons. Just like the sky gets cloudy during Winter Time, sadness makes our lives dark. Sometimes we feel down just like the leaves that fall down from trees during Autumn Time. We choose to go in the direction of our dreams and desires, just like leaves in autumn go in the direction of the wind. We never stop growing in every stage of our lives. As the transition of colors from spring to autumn, we age with time and grow younger to older.